Me, I’m not the multi-million-dollar screenwriter I’m hoping to be, yet. But I’m working at it. Day and night. And I’ve found that many of my cadre – also filmmakers and screenwriters like myself – tend to grouse about the “fact” that landing a successful screenwriting career all comes down to a big, fat crapshoot. Random chance. Luck. Others feel it’s a matter of who you know, or when you know ’em. And still others feel, deep down in their screenwriter bones, that it’s just a matter of letting their pure, raw script talent shine for the rest of the world, and the film industry at large, to lo and behold. But me being a script consultant and professional script coverage procurer, I’m an empiricist. I believe there isn’t one single cause for any one thing, nor is there one single path to any one place. It’s always a combination of causes, a multiplicity of paths, a panoply of traits and attitudes and practices that causes and/or nudges a screenwriter to “make it,” sooner or later, in The Hollywood™. 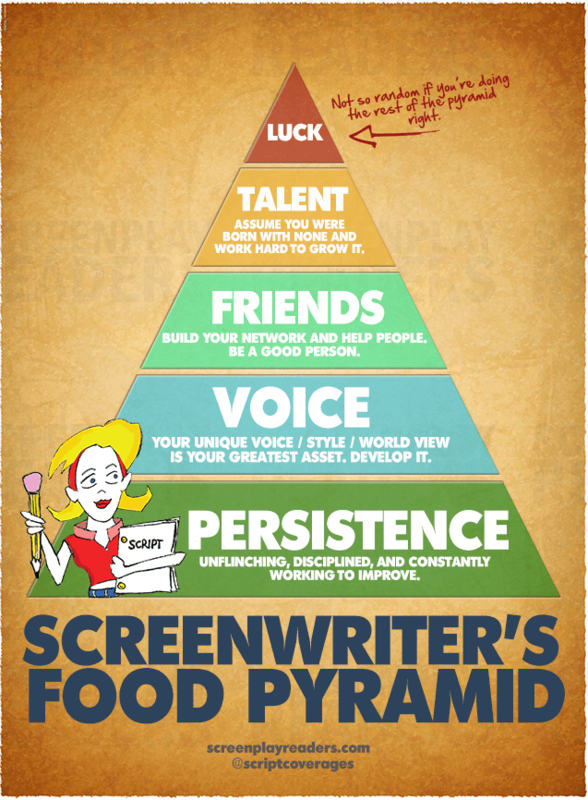 The base of the food pyramid for screenwriters. It’s the nutrition we need the most of. Every single day: writing, growing, learning, advancing our skillset, pushing the craft forward, not accepting the status quo just for a paycheck. Or, if you’re one of those rakish types that just wants your hands on as much skrilla as possible, and don’t care about advancing the craft of screenwriting, you’re at least pretending to try to advance the craft, because the rest of us feel a little better when you do. Screenwriters are a dime a Deusy. Unique voices, on the other sock puppet hand, are rare. That’s why Voice is the second most important “food group” for screenwriters. Find what makes your voice stand out. Hone what makes your world view unique in an industry boiling over with clones. There’s a saying that goes something like “Hollywood’s always trying to catch lightning where it just struck.” But we, as professional meteorologists, know that lightning doesn’t work that way. Nobody in Hollywood knows what’s going to work, until it does, and then everybody copies it, and does it to death. If you have a unique voice, you can be that thing that doesn’t work, until it does. How’s that for an awesomely encouraging sentence? Well, call it what you like, but the results are in: your friends in Hollywood play a major role in your success as a screenwriter. But get this: you don’t have to be phony. In fact, I highly dis- and un- and non-recommend being anywhere near phony if you want to build a network of real film industry friends. Heck, don’t even call them that. They should be just friends. Getting ahead as a screenwriter means helping others get ahead as well. Do favors. Give freely of your time and energy and creative ideas. It all comes back to you, and that’s not a bunch of woo-woo, airy-fairy nonsense. It’s physics! Hint: if you’re doing a solid for someone and it doesn’t feel good, it probably means you’re not really friends with that someone. Only be a real friend. Everybody has plenty of fake ones. Knowing how to tell a story isn’t something you pop out of the womb with, unless you’re Ernest Hemingway baby, or the spawn of Mark Twain and Stephen King. (Now right there is a true American Horror Story.) But you can learn it, and you can be exposed to conditions that develop that talent. Submerge yourself in those conditions. Doubt yourself. Reinvent yourself. Try again. These things hone talent. These things make the difference between a Bach and a Bieber. You’ll notice Talent is right near the top of the “food pyramid.” That’s because with Persistence, a unique Voice, and Friends, talent becomes far less of a factor. If you’re ever in doubt of how little talent matters in the grand scheme of things, just watch how angry-red your face turns the next time you hear of some no-talent schmuck selling a terrible script to Paramount. Are they buying her talent? Do they care whether she’s talented or not? She was persistent, has a unique voice, and has a friend or six that may have got her to this point. In other words, when it really comes down to it, talent is as talent does. Finally you may remember Billy Zane saying “I make my own luck” in that little 1997 student comedy Titanic. Yes, he may have been a snobby, self-righteous toolbox, but he was right about luck, in one key way: the more you try, the more chances you have to get lucky. Luck is at the tip of the “food pyramid” because, like Talent, the more we’re doing everything else in the pyramid right, the less we really need luck. Or I should say, luck becomes its own self-fulfilling thing.